If I didn't need this Sunday to prepare for our Easter musical number in Sacrament meeting in 2 weeks, I'd be doing this St. Patrick's Day review. But since we don't have meetings next Sunday due to the Provo City Center dedication, we'll be reviewing our Easter musical numbers instead with handbells which are If I Listen With My Heart (found HERE) and Hosanna (found HERE). We'll only be using the handbells on the song Hosanna when we perform, but it will be fun to review the 2 songs using the bells on both. So, if you have an extra week for singing time in March (unlike me), I'd recommend this fun St. Patrick's Day treasure hunt! Find all the details HERE. The only document you will need to switch out will be the tags which contain all this year's program songs, in addition to Scripture Power (the activity requires 4 songs so this is my additional song I chose - but throw in your Easter musical number if you want!). Find the current tags HERE. If you have different songs, there are blank tags on the original post so you can write up your own. I've also done this lesson plan without the treasure hunting. Just follow the instructions on each of the tags. Tell the kids that Lucky left instructions on obtaining his pot of gold but you must first complete his 4 tasks! And if you want really good singing, you'll want that pot of gold at the end ;). Looking forward, Easter Sunday we'll be "Getting Ready for Easter" with this really simple (after all, it IS a holiday!) Easter singing time lesson plan I adapted from the Friend. Find details HERE. 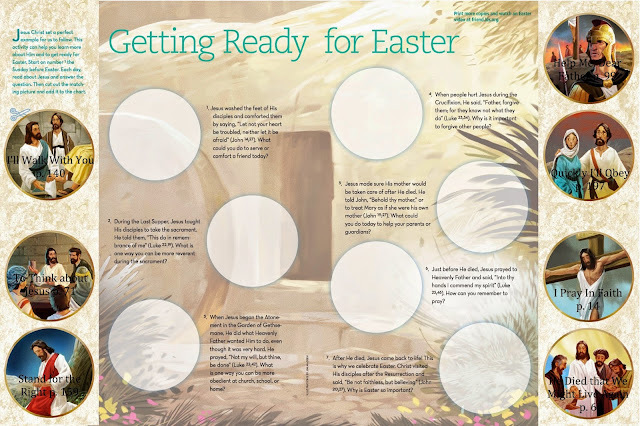 You can also check out all of my Easter lesson plans by scrolling through them HERE. I usually would be doing a General Conference themed singing time the week before General Conference but Easter is going to trump this year. I plan on doing General Conference the week after, the 2nd week in April. See some of my lesson plans HERE. I just need updated everything with the 3 new apostles. If you have any updated material, send it my way!! I was told by the employee at the Distribution Center that they don't even have printed pictures of the new apostles yet. Fingers crossed some will be available soon!! Thank you so much for all the time and work you put into posting all your ideas. I couldn't do this calling without you!!!! What do you do with the kiddos in the primary room while a class is out in the hall looking for the next clue? We'll usually sing a quick wiggle song. If you want ideas, click on my "Wiggle Worm" link under my labels tabs.